Welcome to Dave Jones Design, a small company that manufactures some unique products for artists, multimedia producers, museums, trade show exhibitors, and other video professionals. We decided that there are still a few museums and artists that need DVD synchronizers, so have decided to resume making our premiere product line of DVD synchronizers that control multiple DVD players in frame accurate multi-channel video presentations. Pioneer has discontinued all of their industrial DVD players, the only fully controllable DVD players that our synchronizers could communicate with, so please be aware that these players are now only available on the used market. Used players are still easy to get on eBay. Because demand is very small, we have had to increase the prices on the DVDplay series. We had not raised the prices during the entire 15 years they were originally available, but now that we are only making them as a custom order product, we have had to increase prices. They are also not available from stock. Delivery is typically two weeks, though in some cases might be even longer. Please call for details. Actually, it was never released. Pioneer discontinued their industrial Blu-Ray players, which were the only truely controllable Blu-Ray players. So there was no point continuing to develop the AllPlay. We are moving in a new direction. Actually, an old direction for us. That site will be going through a fecelift soon, so please bear with us. It's difficult to develop a wide range of new products and at the same time maintain several web sites with up to date information. 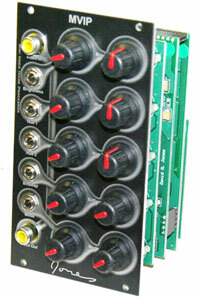 The MVIP is a Eurorack module for processing live and recorded video images. Because it is a Eurorack module, it requires being placed in a Eurorack compatable case with a power supply. It will not work on it's own. This module is a stand alone video module, with a standard definition (SD) composite video input and output. It accepts either PAL or NTSC video, and puts back out the same format video that you put in. The MVIP then allows you to manipulate the image in a number of ways, including reducing colors, positive/negative, luminance colorizing, and digital bit swapping effects (which give interesting contrast shifts, crazy or subtle colors, and multiple digital threshholds. All of the controls are voltage controllable from most audio or video synthesizers. So you can plug oscillators and other types of control voltages to shift colors, and manipulate the style of image processing. The MVIP is currently discontinued and out of stock at all locations. If I receive enough interest I might consider doing another run of them. The MVIP had a suggested US retail price of $595. The O'Tool Plus is a Eurorack module for displaying information about audio and control voltages in a Eurorack modular audio synthesizer. Because it is a Eurorack module, it requires being placed in a Eurorack compatable case with a power supply. It will not work on it's own. The O'Tool Plus is a multi-purpose tool for musicians and audio artists working with audio synthesizers. It can also be useful to video artists who use control voltages to control video modules, though the O'Tool will not directly display video frequency signals. The O'Tool Plus is a two channel oscilloscope, but it is so much more. It is also a level meter, VU meter, spectrum analyzer (linear and LOG), spectrogram, 3D scope, X/Y display, frequency meter, guitar/oscillator tuner, BPM meter, metronome, and DC voltmeter. It is a two volume set (both volumes come together for one price), with a total of 442 pages, edited by Sherry Miller Hocking, Kathy High, and Mona Jimenez. 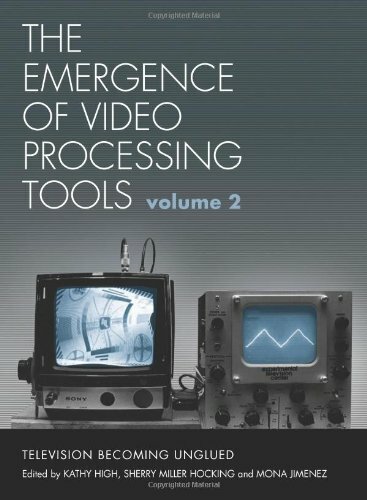 It has a lot of information, and a lot of photos, of the early days of image processing and the people involved in it.